Huebsch was founded in Milwaukee, Wisconsin in 1907 and they began their heritage as a leader in commercial laundry equipment. Today, Huebsch is still headquartered in Wisconsin and continue to lead the industry with energy-efficient tumble dryers designed to save and make you more money. Save Money. Replace your old equipment with more efficient tumble dryers from Huebsch. Dryers that are 15 years old or older are probably costing you money, upgrade to a new tumble dryer and you can lower your gas consumption by 25-35%. Make Money. Huebsch knows that speed and efficiency are important when it comes to tumble dryers. They have crafted the perfect balance of reduced energy consumption and the fastest drying times to help you increase your profits by creating satisfied and repeat customers. Maximize Performance. Equip your laundromat with Huebsch Galaxy 600 tumble dryers and washer-extractors and have complete control of your laundromat. You can optimize performance and maximize your revenue by easily programming and monitoring Huebsch's equipment. Huebsch combines efficiency and the industry's most advanced controls to help you save, and make, more money. Learn more about the incredible benefits of upgrading your equipment to Huebsch below. The controls on Huebsch's Galaxy 600 series offer more revenue-generating controls to grant you full programmability and complete flexibility. 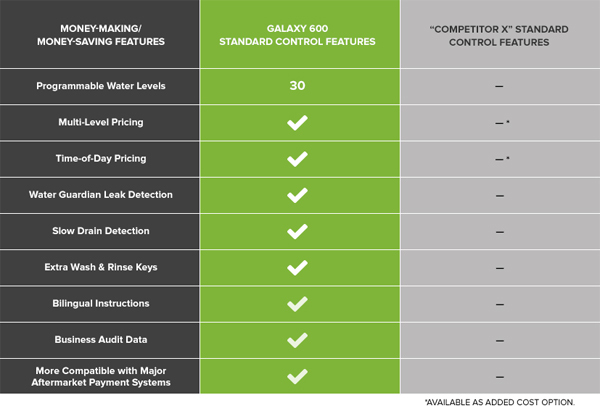 The Laundry Factory upgraded to new Huebsch equipment with Galaxy 600 controls and the numbers below show how monumental the efficiency gap between Huebsch and its competitors is. †Based on average monthly usage of featured laundromat with competitor equipment over a one-year period versus the average monthly usage over a half-year period after switching to Huebsch.